Given the illegal nature of organized dogfighting—a felony in all fifty states—you might think dogfighters would never risk bringing one of their dogs to a veterinarian. But you’d be wrong. A winning animal can be worth thousands of dollars, making it just too valuable to lose to its injuries. 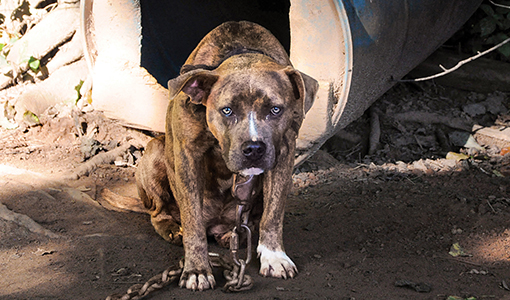 Experts estimate tens of thousands of people are involved in dogfighting across all regions of the United States. Contract matches between dogs, and the illegal gambling alongside them, pay large stakes. And there are even dogfighting studbooks, with winners of three or more fights commanding hefty fees for breeding or pups. “It’s a very lucrative business,” said Nida Intarapanich, V16, who conducted groundbreaking research about dogfighting and animal abuse with associate professor Elizabeth Rozanski and clinical associate professor Emily McCobb, V00, VG02, while a student at Cummings School. “And participants are very good at covering their tracks,” she said, noting that dogfighters often give a fake history of a “yard accident” to explain animals’ injuries, should they be noticed. In December 2017, Intarapanich and her fellow researchers from Tufts and the ASPCA published a study in the Journal of the American Veterinary Medical Association that provides veterinarians the first guidelines aimed at distinguishing wounds caused by organized dogfights from those caused by everyday clashes between pets. “Our study not only serves to inform veterinarians about the clandestine world of organized dogfighting but also provides evidence-based research to assist veterinarians in recognizing dogs that may be victims of this criminal activity,” said veterinarian Rachel Touroo, senior director of ASPCA Veterinary Forensic Sciences and coauthor of the JAVMA article. For the retrospective study, the researchers characterized injuries found in 196 dogs involved in spontaneous fights—often with another dog in the same household or a dog belonging to a friend or neighbor—resulting in a visit to the veterinary emergency room. They then compared these patterns against the injuries documented in 62 dogs seized during criminal investigations of organized dogfighting. In addition to helping veterinarians recognize situations that may warrant reporting a suspected dogfighter to the authorities, the study provides a new tool to help aid law enforcement in prosecution. “Illegal dogfighting is still pervasive throughout the U.S.,” said Touroo of the ASPCA, and the interstate movement of dogs for fighting purposes is a felony. In addition to being animal abuse, dog fighting is considered a serious criminal activity because of its association with illegal gambling, organized crime, illegal firearms, drug dealing, and other forms of violence.